This soup captures the fresh scent of spring. As you prepare the celery, wrap the leaves from the heart in some damp kitchen paper and chill until needed. Set a large, heavy-bottomed saucepan over a medium-low heat. Add the oil and, once hot, stir in the diced celery, leek, onion and potato. Cover and sweat the veg for 10 minutes, stirring regularly until tender. Add the stock, bring to the boil and simmer for 20 minutes until the vegetables are meltingly soft. Meanwhile, strip the leaves from the watercress and purée them with 250ml cold water. Stir the purée into the simmering vegetables and cook for a further 3 minutes, then liquidise until smooth. Stir in the double cream and season to taste. To serve, reheat the soup and divide between four bowls. 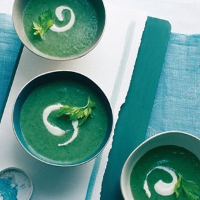 Garnish each bowl with a swirl of crème fraîche and a celery leaf or two.